Enter the Age of Climate Change. Water shortages from longer droughts. Failed crops due to excessive heat. Displaced people migrating to safer areas after sea levels rise. Community resources — like hospitals, infrastructure, agriculture — failing due to extreme weather events. Fights over resources. Impacts to military operations. Gov. Jay Inslee echoed a 2016 National Intelligence Council report during remarks in Seattle on Wednesday, saying the direct and indirect impacts of climate change will drastically affect the world’s social, economic, political and security realms in these and other ways over the next 20 years. 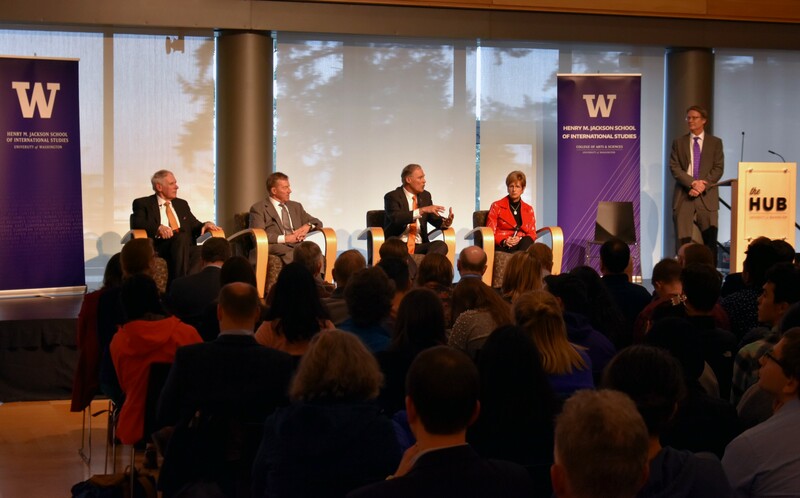 Inslee spoke to several hundred people during a climate security panel discussion at the Henry M. Jackson School of International Studies at University of Washington. He said climate change makes the world a more dangerous place because of disruption on national, regional and global scales. 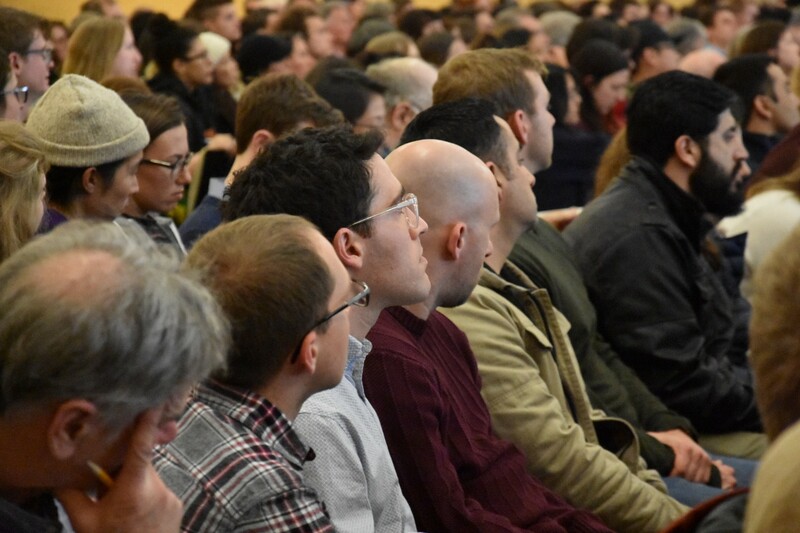 Inslee was joined by Brigadier General Stephen A. Cheney of the United States Marine Corps (retired), Admiral William Fallon of the United States Navy (retired), and former New Jersey Governor Christine Todd Whitman. All three are members of the American Security Project, a nonpartisan organization that educates the world about national security challenges. Fallon said the population has grown dramatically and our technology advances — while they make our lives better — contribute to large amounts of carbon dioxide and other pollutants. During the next 20 years, many countries will encounter climate-induced disruptions such as weather-related disasters, drought, famine or damage to infrastructure. According to the report, these disruptions will stress any country’s capacity to respond or adapt to the threat. Consequently, the country’s authority could weaken and lead to political instability. The countries most vulnerable to this type of instability are those that already struggle with weak political institutions or poor economic conditions. Depending on how much the state authority collapses, the country will create strong pressure for help such as military aid or disaster assistance. This kind of incident, when a country gets pushed over the edge, can have enormous implications for regional stability — and for the security interests of the United States. Retired Brigadier General Stephen Cheney said people don’t understand the magnitude of this. The American Security Project authored a letter recently published by the Washington Post with 58 signatures on it. They sent the letter to the president to criticize a committee that would undermine the science behind climate change. “I did a tour of Europe here a couple years back and they look at us and go, ‘Where is your leadership on this issue? It’s kind of melted away,’” Cheney said. Even if we are successful at limiting warming to 1.5 degrees Celsius, 14 percent of the global population will be exposed to severe heat waves at least once every five years. If we are successful at limiting warming to 2 degrees, 37 percent of the world’s population would be exposed to severe heat waves at least once in five years. And the world is on track for a much more significant increase than 1.5 or 2 degrees.